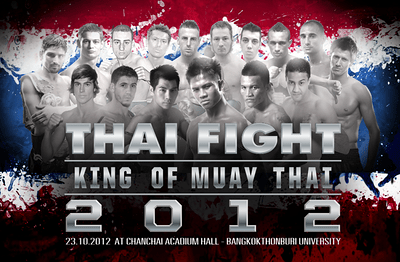 The semi-finals of the Thai Fight Semi-finals will take place on November 25th, 2012 in Thailand. Mehdi Zatout is the French representative who has drawn Singmanee Kaewsamrit, the Thai competitor at 67kg and at this point the favored to win the tournament. Speculation about Buakaw actually being able to participate were made when Buakaw was reportedly sick from his own camp. The winner of the previous edition of Thai Fight published pictures a few days ago of himself in the hospital from his facebook. In his comments, he spoke of abdominal pain and diarrhea. Then not a day later there were pictures of Buakaw cooking and in apparent good health. With so many rumors surrounding Buakaw lately from him making open challenges to Manny Pacquaio to now this sickness one has to wonder why hasn’t Buakaw’s management put a clamp on these rumors more. And maybe try to enhance his image in a better way.Buakaw’s management Team seems more interested in rumor generating than rumor control lately. Buakaw’s camp was certainly done no great favors when Sport Art made statements that pretty much dispelled any chance of Buakaw fighting Thai competition in the near future. And again Buakaw is matched relatively soft in the semifinals as he was in the quarter finals. The 67kg tournament however looks like the precise opposite with even matchups throughout the 4-man semi-finals. I am especially interested in the Andrei Kulebin versus Adaylton Pareira Freitas fight because the Brazillian fighter, Freitas was so impressive in his opening fight for Thai Fight and Kulebin is always sharp and impressive. ~ by fatsoking on November 12, 2012.